In order to record Diversity 2, you must list the build team members by name and include the map link, http://www.minecraftforum.net/forums/topic/2200445 in your video description. This map has been updated to 1.8.8. Running this map in ANY other version of Minecraft is not recommended. Return to the world of Diversity - an epic multi-genre challenge map for single or multiplayer! PC Gamer's #2 Minecraft Map of all time has spawned a sequel. Now with over 2 million downloads, Diversity 2 has quickly become Curse.com's #1 most downloaded map, overcoming the original Diversity map as well as achieving the Guinness World Record for most downloaded Minecraft project. Diversity 2 is a unique form of map. Similar to the CTM style, you are tasked to complete a monument. However, in the Diversity series, the monument blocks are obtained from completing different genre-specific levels. This time, a team of builders were enlisted and the end product is really quite special. We hope you enjoy the map. 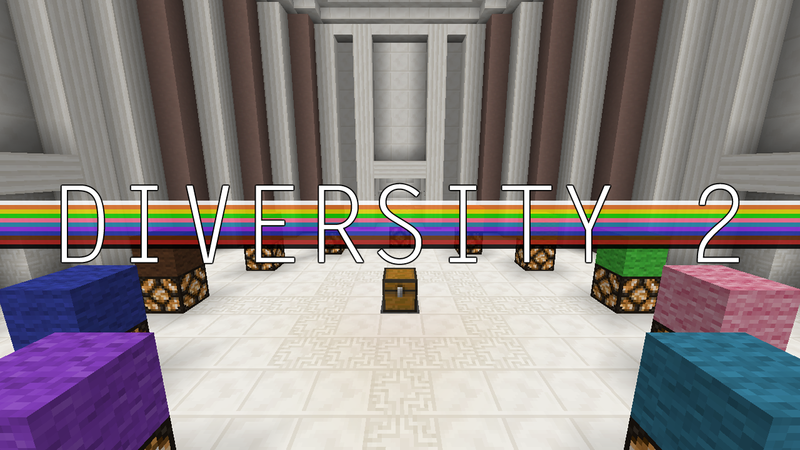 Diversity 2 also proudly features custom skins from over 650 members of the Minecraft community! Don't type commands. Diversity 2 is a very complex map that works only if the map is unaltered from the command blocks placed. Do not change your gamemode, unless absolutely necessary. For Multiplayer, you MUST have command blocks enabled. We recommend you keep the game to 2 players, but 3 could work. This map is NOT compatible with Bukkit. Our apologies. For all other info, please visit the Minecraft Forums. CAN'T FIND THE MAP IN YOUR SAVES? Do NOT place the entire DIVERSITY 2 PACKAGE folder in your saves. ONLY place the Diversity 2 (v.X.X.X) into your save folder. I Love This Map!!!!!! Amazing Pls Make More! It's the best map ever! I use Minecraft PE for several years. Only play on this map. Thanks, I like it. can i use optifine with this map? Ok, I do like the multi-stage themes, but.. Some maps are broken for me, one of them will show the opposite block. This is an awesome map as always! I have not much to say other than that this map is amazing and totally worth the play! Takes a while to download xD I feel bad for Ssundee waiting this long, but dude! Ssundee plays ur map, so that's why I came to play. I WANT TO BOSS BATTLE!!! This is amazing and I personally wish there was a diversity 3. Only annoying part is when you cant shoot the boss. I loved your map and I loved how at the end you have all that stuff. Its amazing. That's a Minecraft bug. It is annoying but it's not related to the map itself. how you make a map? You build something you like with a story of effects or something. Then you post it online for anyone to play. Can't wait to try this one!! !